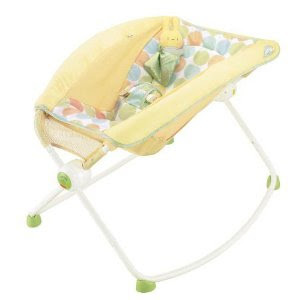 What to buy for Baby? If finding out you're pregnant wasn't overwhelming enough, having to shop for and set up a nursery really boggle the mind. The list of things you need is a mile long. The prices you have to pay make your eyes pop out of your head. You really have to decide what is important for baby and what is really just a whim because it looks cool. Okay, really a lot of it looks cool. Have you seen the Rock N' Play? I want an adult sized one that I get to sleep in. 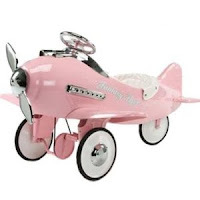 O r how about this Pink Pedal Airplane? Hey, Nanny Dani, I think I've found something for you to save up for! These are just the icing on the cake! There are SOO many cool things like this! And don't get me started on the vintage things that are so awesome that I didn't appreciate or ever get as a kid. I have a laundry list of all those things that I want, just because I never had them. But tell me Swell Shoppers, What do I really need to add to my list of items to buy for Jellybean? I know that my list is probably drastically different from the list I should have! Like what you see on Mrs. Shopswell? Subscribe by email or Like us on Facebook or Follow me on Pinterest! 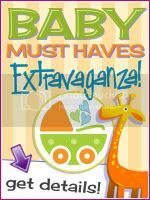 My friend Becca over at Mama B Blog is giving away a bunch of baby items in anticipation of her little girl's arrival this summer. Head over there and enter the giveaways and win something! 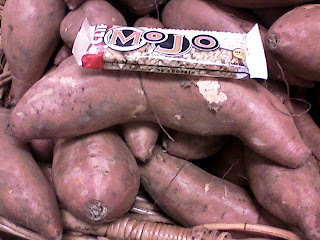 *(Okay, so this is the biggest Sweet Potato I've ever seen. Jellybean you are about 5.6 inches long and about 6.7 ounces now and keep on growing rapidly. Probably explains why I've finally gotten my appetite back. I haven't had any weird cravings this week, but I have made homemade french fries the last few nights. I think that I'm feeling you move around, but I could just be mistaking you for gas pains. Boy, I've never burped so much in my life! What are you doing to my body!? Your bones are hardening, so I expect some good punches and kicks soon! Your ears are now facing forward and are completely formed so you can actually hear me talking now. I need to start playing Dada and Counting Crows for you before Daddy starting pumping in the Steely Dan. I want to make sure you love GOOD music. My 31st birthday is Sunday. My last pre-baby birthday. My birthday was always a really big deal to me and I always turned it into an event. This year, I'd just like a good night's sleep. You are making it hard for me to get comfortable. I love you Jellybean! There are only 22 more weeks to go before we get to meet you. Next week, we get to find out if you are healthy and whether you are a boy or a girl. So exciting! I can't wait to continue this ride with you! Like what you see on Mrs. Shopswell? Follow us or Like us on Facebook! I never expected to get pregnant naturally because of PCOS, so this was a welcome surprise. However, for those that don't know, I was in a car accident (t-boned while going through an intersection) 17 months ago that crushed my left femur and pelvis and broke my right pelvis in multiple places. I spent 4 months in a chair unable to walk or put any pressure on my left side. Another 6 months just trying to get my left leg to start regrowing muscles so I could walk again. And the last 7 learning how to walk with a cane and do things for myself on my own. I was already overweight pre accident, but the months of sitting and steroids made me balloon up. I see a MFM because of my weight, but also out of fear of how my pelvis is going to adapt to pregnancy and giving birth. I have a femoral rod and pelvic plate with a bolt attachment. My right pelvis never completely healed because of needing a side to put pressure on. I'll admit that I'm starting to feel really overwhelmed and worried about giving birth and then caring for a baby by myself. I try practicing things like getting our of a rocking chair while holding a doll or carrying things while holding a doll, but nothing seems to work right. I have my husband and my mother lives with us after being my caretaker for so many months, but I want to be able to do this and feel like I'm being a mom. As you might have noticed, there is both Mrs. Shopswell and Mrs. Shopswell at Home. I've been thinking about what to do with both of them for the last few weeks. I'm kind of torn. Mrs. Shopswell was always supposed to be a coupon/money saving blog. While, I'll always struggle at paying full price, my life has really gone in a totally different direction. I'm not saying that I'll never go back to that money saving person, who can't wait to share it with the world, I'm just not there anymore. We still coupon and save money, but it isn't the focus of our lives. But at the end of the day, I'll always be Mrs. Shopswell. So I'm going to continue to blog as Mrs. Shopswell and use Mrs. Shopswell at Home for reviews and tutorials. So remember to follow both! Wordless Wednesday: What You Talkin' 'bout? Like what you see on Mrs. Shopswell? Subscribe by email or Like us on Facebook or Follow me on Pinterest ! Jellybean will be here soon! .Missing something? Find it here. Life With A Little Added SAS!